What can’t the Raspberry Pi do? Well, it definitely can operate as an AirPlay receiver for Apple’s Wi-Fi audio streaming protocol, it turns out. Cambridge engineering student Jordan Burgess managed to convert one of the $25 open computers into an AirPlay receiver along the lines of Apple’s AirPort Express, using open source software, a USB Wi-Fi adapter, an SD card, a micro USB cable and the Pi itself. 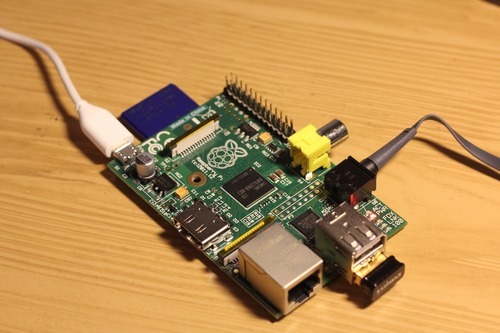 The process for setting up the Pi once you have all the hardware ingredients is fairly simple, especially if you’re comfortable working with Terminal and with the basics of installing an operating system onto the Raspberry Pi. Still, this isn’t for users who aren’t comfortable outside of their computer’s standard GUI. But if you’ve got the time and the skills, you can save a fair amount using this version vs. others. Burgess estimates that the total build cost is around £30 ($48 U.S.), vs. $100 for the Apple TV or AirPort Express. Speakers with the tech built-in also cost well in excess of that on average. There are some caveats, however, and the biggest may turn off audio quality enthusiasts hoping to set some of these up and running in their own homes. Burgess notes that the Raspberry Pi lacks a good digital-to-analog converter (DAC), meaning that you’ll get background noise and distortion when you plug the Pi directly into the 3.5mm output of a set of speakers. A USB sound card is a possible fix for this limitation, however, and some home theater receivers act as DACs if you’re using it as a way to add AirPlay functionality cheaply to your existing living or media room setup. With a few more refinements to help increase audio quality, this could be a cheap way to help wire an entire house for sound, Sonos-style, so long as you’re already committed to using Apple devices and iTunes.